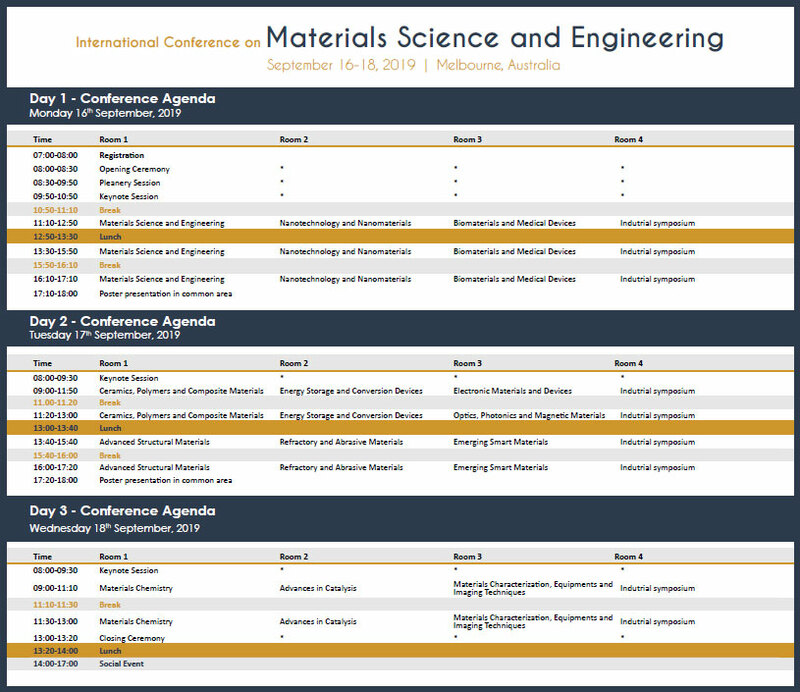 Materials Oceania 2019 will consist of stimulating program of plenary sessions, keynote speeches, panel discussions, poster presentations and exhibitions in Materials Science and Engineering. We aim to make the conference a genuine two way process and as such, knowledge transfer, commercialization and industrialization can be further enhanced through the interactivity. Detail conference program will be updated 3 months before the beginning of the conference. Keynote addresses: Keynote speakers will be allotted 25 minutes to present their results, followed by a 5 minutes discussion period. Regular Contributed talks: Authors of contributed talks will be allotted 17 minutes to present their results, followed by a 3 minutes discussion period. Students Oral talks: Authors of students oral talks will be allotted 12 minutes to present their results, followed by a 3 minute discussion period. Speakers should bring their presentations to the conference saved on a USB memory stick. It is suggested that you email a copy of your presentation to your personal inbox as a backup. If for some reason the files can’t be accessed from your flash drive, you will be able to download them to the computer from your email. Please prepare the presentation in PPT files, PDF is not recommended. Please refer to the program page of the official website for your session and presentation information. Laptops equipped with Windows 10, Office 2010 Pro English (Word, Powerpoint, Excel) and Adobe Reader are provided. If your presentation files contain movies, please make sure that they are well formatted and connected to the main files. Projectors are equipped with standard VGA connection ports. Mac users should bring their own adapter cord. Please re-check this program prior to the conference to confirm if any changes have been made to your session. Presenting a poster provides you with the opportunity to engage with other attendees, share your research, and start conversations that may lead to future collaborations. Your poster enables you to discuss very specific aspects of your work. Maximum poster size is 1 meter wide by 1 meter high. Push pins for attaching the poster to the board will be provided. Poster presenters will be directed to the designated board at the start of the poster session. Author must be present to provide details and answer questions during the selected poster session times. The poster session schedule, which is developed by the session theme chair, will be emailed to all registrants the week prior to the conference.